After five years of service, the dog version of 20 and out, the Marine Corps’ mascot, Chesty XIV has relinquished his responsibilities and is heading into retirement. Marine Barrack Washington commanding officer Col. Donald Tomich presided over the English bulldog’s retirement ceremony. The Corps honorably discharges its mascots after a few years, giving the dogs plenty of time to enjoy retirement with their adoptive families. The Corps adopted the bulldog as its mascot after World War I. The now 15 Chestys were named after five-time Navy Cross recipient, U.S. Army Distinguished Service Cross recipient and Silver Star recipient Marine Lt. Gen. Lewis “Chesty” Puller. Chesty XIV followed in the footsteps (paw prints?) of the previous Chestys that have been serving as Corps mascots for 61 years. 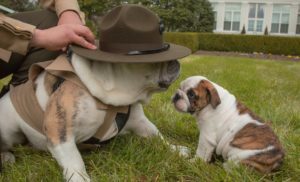 Chesty XIV’s replacement, Chesty XV, arrived at the Barracks as a 10-week-old puppy in March, has completed his entry-level training, where he was even issued his own physical-training safety belt. The private will immediately begin representing the Marine Corps at ceremonial events in the nation’s capital. Though Chesty may be the most famous Bulldog in the Marine Corps, he is not the only one. Bulldogs often serve at boot camp training installations, where they participate in parades, ceremonies, and morale-boosting activities. In August 2017, Opha May became the first female Bulldog mascot in the Marine Corps. The pup is named after Opha Mae Johnson, who became the first known woman to enlist in the Marine Corps in August, 1918. Johnson joined the Marine Corps Reserve during World War I, and since she was the first in line that day, she was designated as the female Marine. Johnson’s first duties were as a clerk at Headquarters Marine Corps, managing the records of other female reservists who joined after she did. Namesake Opha May is now Parris Island‘s 21st mascot.